I can’t believe I’m actually sharing this with you. This is one of my summer secrets. 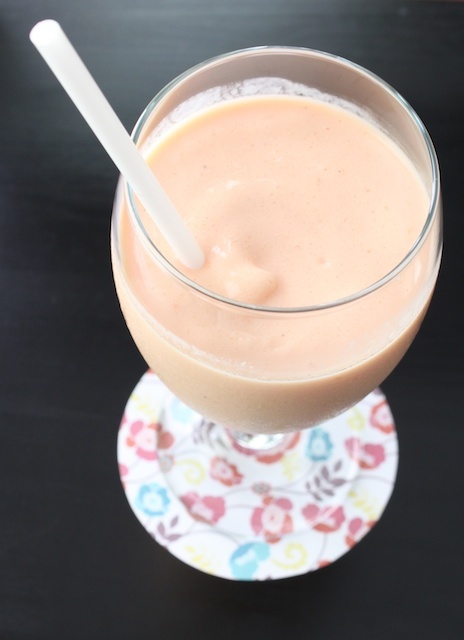 Papaya milkshake is a favorite around here. It is the best type of milkshake ever. I grew up in Hawaii where we had access to the juiciest, sweetest and largest papayas. Oh. The kind that melts in your mouth. Yum. If you are lucky enough to have good papaya around where you live, you will have to try this. Cut papaya in half lengthwise and scoop out the seeds. Using a spoon, scoop out the meat of the papaya and put into the bottom of blender. Then add enough ice to fill the remainder of the blender. Add remainder ingredients and blend until smooth. Add more milk if needed. » Tell me… What’s your favorite kind of milkshake? Yum! I definitely wish I had a fresh, sweet papaya right about now…I’ll have to keep and eye out. Double chocolate all the way. But this looks really good! Do you think frozen papaya would work as well? i’m sure it would work with frozen papaya, but it would be thicker since the juice from the fruit is frozen. so you may want to add more milk to it. I remember this milkshake at your mother’s home! Yum!! This will be a keeper!